Organized people are awesome! Everything is in its proper place. An organized person is an asset for a trucking company. The trucking business is mind-numbingly bureaucratic, paper-laden, and at times completely overburdened with paperwork. Knowing this is why we at AFT Dispatch decided to handle all of the paperwork for the carrier. We’ll do our part to make sure you have every load-related document. What you do with the documents is up to you. Some carriers print everything, others prefer their paperwork in digital format. The issue of organization remains. 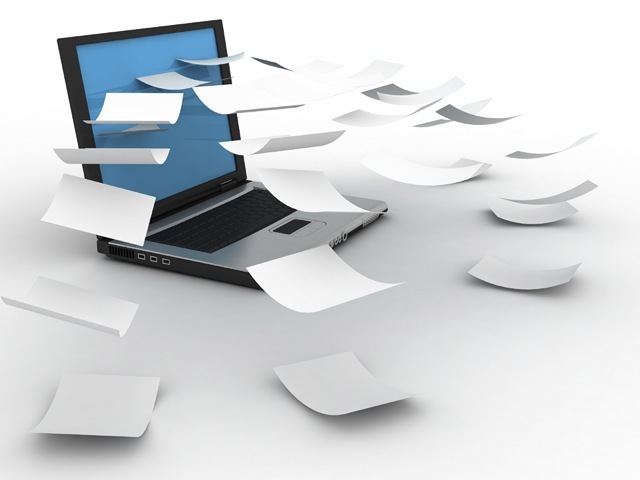 What do you do with the physical and/or digital documents? In this post I’ll show you what I like to do with the many documents we deal with on a daily basis. I’ll show you what we’ve done in the past, what we do differently now, and how it impacts our business. I’ll basically show you how to organize your trucking business. One thing that helps me stay organized with our company documents is consistency. If you’re consistently working with your established system, you’re constantly improving it and becoming more efficient. As of this writing, my 2015 all encompassing business folder holds over 1,900 files in over 230 folders. In 2014 we finished the year off with nearly 2,400 files in 250 folders. I cross reference different folders with shortcuts to avoid duplicity so the actual numbers aren’t exact but do show the sheer number of documents. Every year I rebuild the new year’s folder structure. I copy frequently used files like our MC Authority Letter, an updated W-9, insurance certificate holder request forms, RMIS insurance certificates, our UCR and SCAC codes, and other documents. Billing as its own folder which includes folders for BOLs, Invoices, Quick Pays and ACH, Rate Confirmations, and Referral Income. I also have a specific way of naming files making it easier for to reference and find things much more quickly. 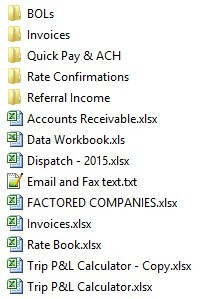 The main billing folder also holds Excel workbooks like Accounts Receivable, a Data Workbook, Dispatch invoicing, a list of factored companies, Invoices, a Rate Book, as well as a Trip P&L Calculator which I discuss in another post. All Invoices, BOLs, and Rate Confirmations are filed in a specific way. Here’s an example, if I work with Coyote Logistics and it’s my first load of the year, it would be named as follows. 101 – “Coyote Logistics – Invoice“. When I look at this, I know this is invoice 101, for Coyote Logistics, and it is an invoice. Following the above example if there’s an invoice, there’s probably a rate confirmation. The rate confirmation naming structure would be as follows. “101 – Coyote – Rate Confirmation-signed“. This file name tells me right away that it’s in reference to invoice 101, it is with Coyote Logistics, and it’s a rate confirmation. The last part “-signed” is appended to every file that is signed. This way I always know that the documents requiring a signature have been signed. The naming structure for the BOL would be the same as the two above examples and would look like this “101 – Coyote Logistics – BOL“. What’s important is to build onto the system and continuously use it. When you use it, you’ll improve it. If you don’t have a system or your system isn’t cutting it, this would be a good place to start. I hope to write more on this topic in future posts as I believe organization to be of utmost importance to running a profitable and efficient trucking company. Thanks for reading and please tells us how you stay organized in the comments section below.